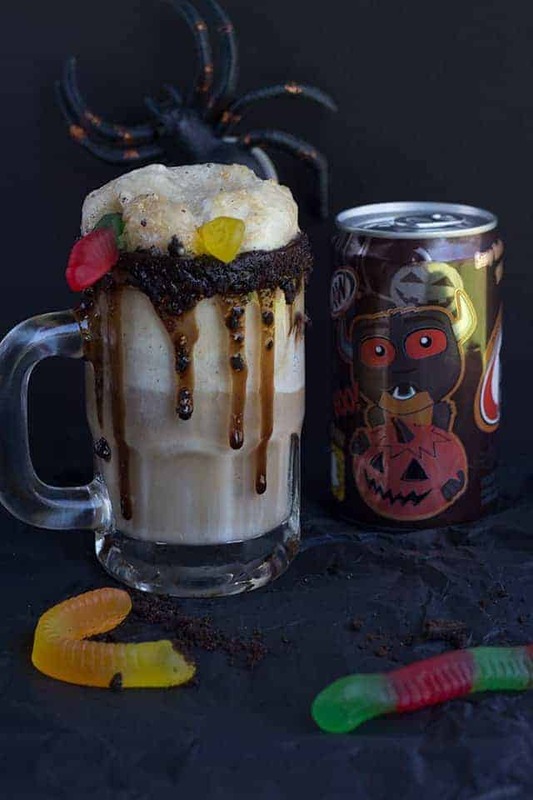 This Dirt Cake Root Beer Float is the cutest float ever! 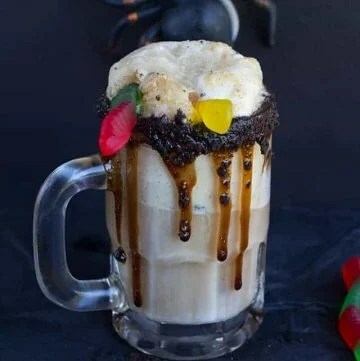 It has the classic root beer float flavors with a twist of cookie added in. It reminds me of the dirt cake with the crushed cookies, chocolate syrup, and gummi worms. Hence, the name. This is a sponsored conversation written by me on behalf of A&W® and 7UP®. The opinions and text are all mine. Root beer floats are and always have been my favorite way to have ice cream! I didn’t get them often as a child, but it was quite the to-do when I did get them. I remember staying with my cousin and her kids as a child. She made us all a root beer float and that’s when I first fell in love. It’s the root beer, man. I’ll drink it anyway I can get it, especially if it’s in cute mini monster cans. 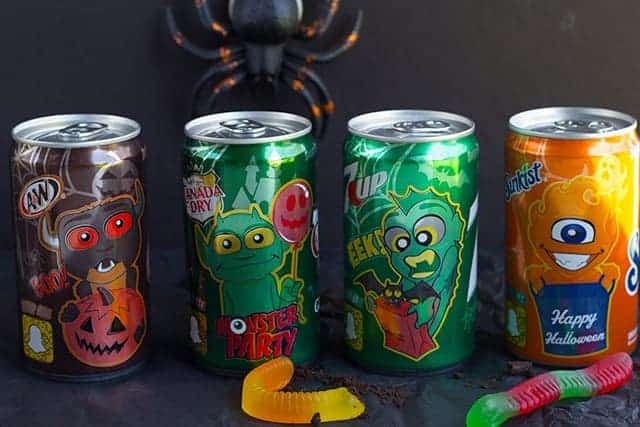 Let me show you the variety of little monsters on the cans because they are so stinkin’ cute. You must tell me which one is your favorite too. Drink and picture wise, it’s A&W all the way. The 7UP cans are pretty cute too though. They would make great little drinks to have on hand for a Halloween party. You can drink them on their own or throw them in recipes likes floats, punches, cakes, brownies, etc. 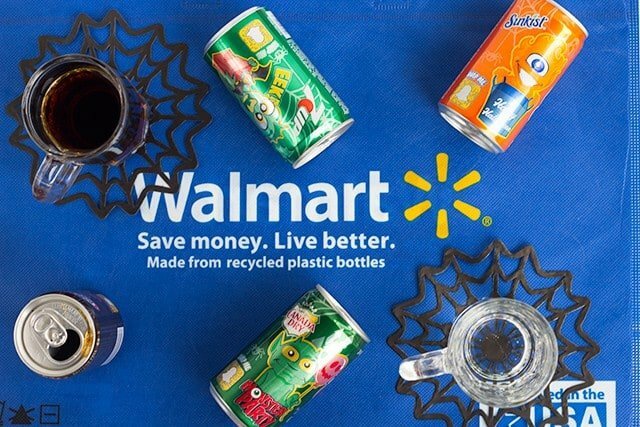 The best part is, you can grab them, as well as mini minster 2 liters, at Walmart until October 31st along with everything else you’re going to need for this recipe. Halloween really gets my creative juices flowing and those cute little cans really struck a chord. I thought incorporating dirt cake in somehow would be perfect since EVERYONE loves dirt cake. I initially tried chocolate ice cream instead of cookies n cream but I really didn’t like how the chocolate was competing with the root beer flavor. You are more than welcome to try it though. I think my favorite part of this drink are the drips of chocolate syrup. It adds a messy, but creepy feel to the float. It’s probably best to use a mug with a handle on it so you can grab it up without getting messy yourself. My mugs are pretty short. It’s hard to tell in the photos, but if you check out the video you’ll notice immediately! 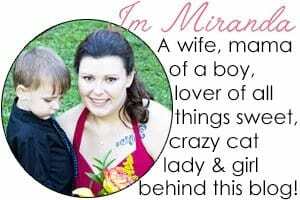 I found them at a consignment shop near Sunset Beach, North Carolina otherwise I would link to them for you. Let it be known, if you’re going to use a straw for this float, I recommend getting the large straws otherwise your cookies from the cookies n cream ice cream are going to clog up your tiny straw opening. Been there, done that without thinking. I’m such a child though. I had my face in the foam gobbling it up and licking the chocolate syrup and cookie crumbs off the rim. I have no shame. 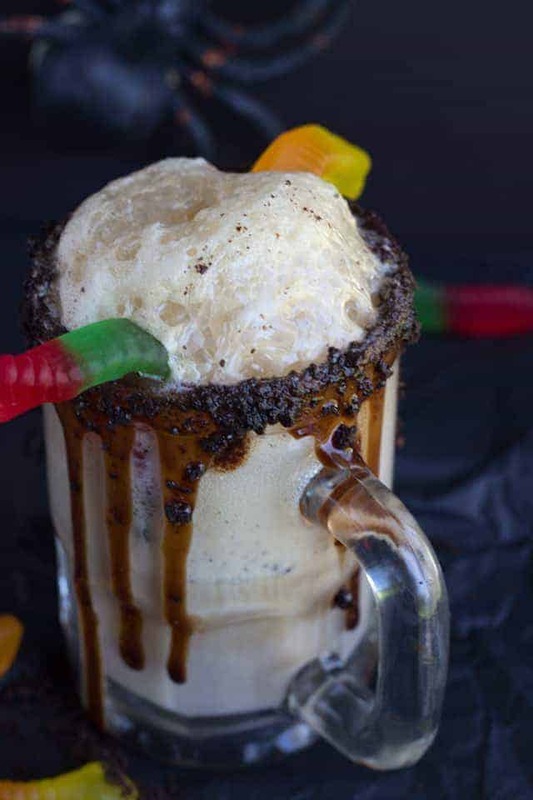 The dirt cake root beer floats have all the great flavors of the original float with a twist of chocolate cookie, chocolate syrup, and gummi worms! Add the chocolate syrup into a baggie and cut a small hole out of the corner. Pipe the syrup on the outside of the glass and on the rim of the glass. Let it drip down some. Remove the filling from the chocolate sandwich cookies. Crush the cookies to make the crumbs. Add to a shallow dish that is bigger than your mug. Dip the rim of the mug into the cookie crumbs. Scoop 1 - 2 scoops of ice cream into the glass. My glass was small, so I did one. Pour the A&W Root Beer over top of the ice cream. Let the foam go down and pour more in until the mug is full. 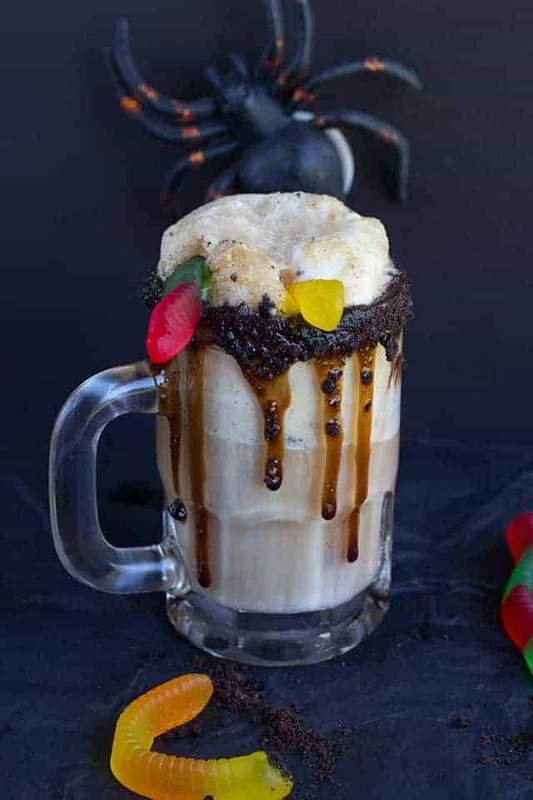 If Halloween does NOT get your creative juices flowing, you can hop over to www.TheCraveyard.com for recipe inspiration. I almost forgot to mention that these Mini Monster cans have a Snapchat Snap Code to unlock a special Snapchat filter for 1 hour. All you need to do is scan the ghost icon on the cans by holding your phone with snap open over the ghost icon and press the ghost icon on your screen. Now remember, you only have 1 hour so get snapping as soon as you get your filter unlocked because it will be gone before you know it.